A special dress for the prom, a pageant dress, cocktail dresses, a mother of the bride dress, or even christening gowns, we at Helga's can take care of your every need. Bring all parts of your dress and the shoes that you will be wearing. This will establish the exact height and make sure the finished hem will be at desired height. Also, bring the under garments which will be worn with your dress. As the shoes are important to the finished hem, so are the undergarments to the overall perfect fit. There could be a difference of up to 2 inches in the hemline or waist when foundation garments are worn. A special note - make sure that you don’t have makeup on for your fitting as you would like to keep your gown clean and stain free as possible. Length – Regardless how many layers your gown has, making sure the length is correct so that you will not trip when making your grand entrance. Waist – To be a princess for the day requires that your gown is form fitted. Your gown should extenuate your figure. Straps – This will help in verifying that your gown rests properly on your shoulders and is positioned right. Necessary adjustments will be made to provide the desired “V” line. As each young lady is unique, so is each dress. Don’t expect to find the perfect dress that will not need any alterations. 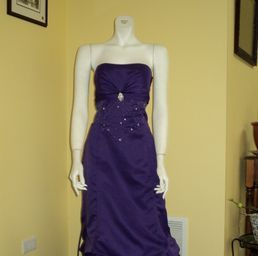 Just as the perfect pair of jeans needs some type of alterations, so will your special occasion dress. It is always better to take in seams than to let out or have to add material if the gown is too small. It is not recommended to purchase a dress that is one size larger than your own. From an alteration perspective, the gown in your correct size can in most cases be altered. However, a larger gown is cut proportionally larger in all aspects. So, if you only take in the waist, the rest of the garment will not be a perfect fit. To the contrary, there are gowns that are manufactured to span a wider range of sizes. For instance, dresses that have zippers are made for a particular size where corset ties can span multiply sizes. It is best to find a dress that is close to your size. Typically dress boutiques carry dresses to fit young ladies that are 5’ 9” and shorter. You may need to reconsider the full length dress by having it shortened. An alternative would be to shop for specialty long dresses and have tailored to your desired length. When should you schedule your fitting? There is not a straight forward answer…it depends. Stress has a way of fluctuating your weight. We recommend young ladies have their dresses brought in for a fitting 2 week minimum (but not greater than 4 weeks). This will insure that there is adequate time to make necessary alterations and the fit will be perfect. At Helga's, we will discuss your concerns as well as provide our expert opinion and recommendations. If there are major modifications needed on your gown (other than general hemming, straps, and waist), please bring it in for a fitting to discuss with one of our staff.